"Grab a phone book, go online if you have to. I want some 411 on this cat!" You have to love the sheer ingenuity and survival skills of young teenagers in Hollywood films. Take for example Erik (Jones III), a Philadelphia high school student whose goal is to run around the City of Brotherly Love and staple posters to any surface available to promote the newest album from rapper Prolifik (Nelly). These posters are called "snipes," and Erik is the best at plastering them around the city. His father (Johnnie Hobbs Jr.) wants nothing more for Erik than to follow his career and work at the post office, but his son sees the rap career path as a more impressive and particularly less violent one. This all changes when Erik and his friend Malik (Mpho Koaho) stumble upon a mysterious happening (as well as a pair of dead bodies) at a recording studio late at night. Kidnappers have taken Erik's friend Cheryl (Saldana), Prolifik, as well as the masters for the upcoming Prolifik album and are holding them for ransom unless the head of Ill Records, Bobby Starr (Winters), will pay an ungodly sum of money. The problem for Erik is that Bobby wants to handle things in-house, with no help from the police, and his brand of investigation means causing violence until he tells him where the masters are and where he can find Prolifik. But Erik knows nothing, except for a secret about Prolifik that could change everything. The central idea of Snipes offers a promising look behind the scenes of mid-major record labels and the tireless advertising and promotion that comes with establishing yourself in the cutthroat world of music. Then, as if by some sort to screenwriting mandate, the film becomes more focused on the "cutthroat" aspect. It is here that the picture loses the appeal that it delivers in the early moments. We are introduced to a world that is dark, urban and gritty and the film has an edge lacking in other low-budget films about struggling artists and rundown neighborhoods. Erik is given strong parental guidance, and to credit the script, the part of Erik is written better than other teenage protagonists in similar films. But for those small accomplishments, there is nothing hiding the fact that Snipes invariably turns out to be a run-of-the-mill action thriller. The villains and heroes discharge guns in wide open spaces without even a hint of interest by the police, and when Erik is given a nose job by way of a switchblade (à la Chinatown) it is to be assumed that neither his father nor teachers have taken the time to notice. There is a set up involving the mafia and Starr, as well as subplot involving rival snipes, but what does it really matter? 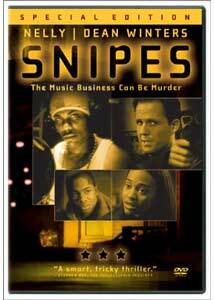 The biggest reason that you are being given a chance to purchase Snipes in a decked-out special edition DVD is largely because of the inclusion of rap superstar Nelly in his debut film role. While his role seems more suited for cameo billing, his work is capable and he shows some real promise if he picks the right projects. Winters does a good job playing over the top, and the scene in which he interrogates and tortures Erik is a film buffs dream come true and is undoubtedly the best single moment that the film has to offer. Image Transfer Review: Strangely, the 1.85:1 widescreen transfer is nonanamorphic, which is too bad because it could have propelled the transfer into truly worthy accolades. The transfer boasts sharp and rich colors, with very nice black levels that show a nice amount of depth. Sharpness and detail are each very well done, giving the transfer a very smooth look. Anamorphic enhancement would have been nice, but what is here looks better than I expected. Audio Transfer Review: The Dolby Digital 5.1 mix receives a lot of energy from the hip hop score, but little else from the remaining channels. The .1 LFE is constantly pounding throbbing bass that will likely shake your entire room, but it drowns out the surround speakers quite often. Dialogue is crisp and clear throughout with no distortion. Extras Review: Two commentary tracks lead off the special features for Snipes. The first, and more technical, features director Rich Murray and editor Seth Anderson discussing everything from locations to casting. The track is a bit dry in terms of real information and in-depth discussion of the film itself, but it works well for the most part with very few moments of silence. The second track features Murray, Dean Winters, JD Williams, Sam Jones III, Rashaan Nall, and Schooly D and is undoubtedly the better track of the two. The group has terrific chemistry and from the first wry remark made by Winters, you know it is going to be a worthwhile listen. The remaining extra features are fun, if a bit unnecessary. Seven deleted scenes are featured and while it would have been nice to have seen a moment or two that helped to flesh out some of the problems, those moments are missing. Next up are cast interviews that are fun enough to watch once, but there is no real information to be gathered here. A music video for Put Yo Sets Up by Red Eyezz is also included. The theatrical trailer as well as a television commercial for Snipes is included, though the television spot is simply a cut down of the trailer and is repetitious. My favorite extra feature is footage from the St. Louis premiere of the film, where we see such stars as Nelly and Rams running back Marshall Faulk arriving on the scene (which I enjoyed because I live close to St. Louis and have been to this theater). A bevy of special features as well as above-average audio and video (though I am baffled by the lack of anamorphic support) tracks makes a strong case for Snipes to be recommended on the merits of the DVD alone. But there is still that small issue that the film is just not very good. For fans of Nelly, you will be disappointed; for fans of a good thriller, you will be wishing you had spent your money on something more important.